WASHINGTON, April 25, 2002 -- InSTEP LLC is voluntarily recalling about 4,300 Hitchhiker III Trailer Bikes. The bike's universal joint system can fail, causing a rider to lose control of the bike. This poses a risk of injury to either of the two riders. CPSC and InSTEP have received 10 reports of universal joint systems failing, including three reports of consumers who suffered contusions and abrasions. The recalled Hitchhiker III trailer bikes are attached to a lead bicycle by a universal joint system with two side bolts and a top- mounted quick-release bolt (as seen in the photo below). The recalled NH300 model trailer bikes have the words "HITCHHIKER III" printed in red on the trailer arm and the "InSTEP" logo printed on the bottom tube and the safety flag. Retail stores nationwide, including Toys "R" Us, The Sports Authority and One Step Ahead, sold the bikes from February 2001 through May 2001 for between $80 and $110. Consumers should stop using these trailer bikes immediately and contact InSTEP at (800) 242-6110 between 8 a.m. and 5 p.m. CT Monday through Friday, or by e-mail at info@instep.net, for a free repair kit with instructions. For more information, consumers can log on to the company's website at www.instep.net. WASHINGTON, April 25, 2002 -- Specialized Bicycle Components Inc. is voluntarily recalling about 2,200 bicycles. The rear seatstays, the tube behind the seat that connects the rear axle to the rear shock, can break, possibly causing the rider to lose control and crash. Specialized Bicycles has received 39 reports of seatstays breaking. No injuries have been reported. The recall involves model year 2002 Enduro-brand bicycles. The Enduro Pro FSR is silver; the Enduro Expert FSR is black; the Enduro Comp FSR is yellow; and the Enduro FSR is blue. The model name of the bicycles is located on the top tube and the brand name is located on the down tube. Authorized Specialized dealers nationwide sold these bicycles from September 2001 through February 2002 for between $1,650 and $2,750. Consumers should stop riding these bicycles immediately, and return them to their local Specialized dealer for a new rear seatstay, which will be installed at no charge. For more information, call Specialized at (800) 214-1468 between 8 a.m. and 5 p.m. PT Monday through Friday. 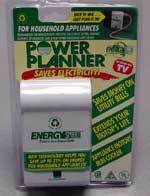 WASHINGTON, April 24, 2002 -- Coast Energy Management Inc. is voluntarily recalling about 45,000 Energy Smart Power Planners. The Power Planner is a device connected between motorized appliances and wall outlets that is intended to save electricity. The recalled units have reversed polarity, posing a shock hazard to consumers. Coast Energy Management has not received any reports of incidents or injuries involving the Power Planners. The recalled Power Planners are white plastic, about 5-inches in height, and have the words "Energy Smart" printed across the front in green writing. They have a 10-amp rating and the model numbers SP010-N or SP010-NV. The model numbers are printed on a green and silver label attached to the left side of the device. The device has a three-prong plug built into the back and a three-prong receptacle on one side. A green light at the bottom of the unit flashes when the product is first plugged in and then lights steadily, indicating proper operation. The recall includes Power Planners with lot numbers 6/2-01, 10/2-01, 25/2- 01, 28/5-01, 20/6-01 and units without a lot number. The lot number is printed on a label affixed to the back of the device. Home Depot, Costco, and Orchard Supply Hardware stores sold these Power Planners from September 2000 through April 2002 for between $40 and $45. Consumers should unplug these devices immediately and contact Coast Energy Management to receive a replacement and a free gift. Consumers can contact Coast Energy Management at (800) 808-8897 between 8 a.m. and 5 p.m. MT Monday through Friday or visit the firm's web site at www.energysmart.com. WASHINGTON, April 4, 2002 -- Crystal Mountain Water Cooler Corp. is voluntarily recalling about 12,000 hot & cold water coolers. Approximately eighty percent of the water dispensers were sold in the United States. The hot & cold water dispenser's heater band can short circuit, posing a fire hazard to consumers. Crystal Mountain Water Cooler Corp. has received about 20 reports of the water cooler's insulation smoking, or igniting the unit. Damages ranged from minor smoke and fire damage up to $200,000 in property damage. The Hot & Cold Water Dispenser is an upright water dispenser, with two faucets. One faucet has a red lever and one faucet has a blue lever. The unit stands at 35 5/8 inches-high (98.1 cm2), weighs 36.43 pounds (16.56 kgs) and has a base area of 120.5 square inches (777.41 cm2). To determine if the water dispenser is subject to this recall, the serial number plate is located on the back at the top of the water dispenser. Only water coolers with serial numbers between 1199125 and 1100175 are included in the recall. The third and fourth digits of the serial number represent the year of production. Crystal Mountain and its distributors sold these water coolers in the U.S. and Canada from May 1999 through July 2000 for about $300. Consumers should turn off the hot tank power switch or simply unplug the units and contact Crystal Mountain at (866) 678-4886 anytime to receive repair information. Consumers should have the serial number of their water cooler available at the time of the call. The recall is being conducted in cooperation with the U.S. Consumer Producer Safety Commission (CPSC). Crystal Mountain issued registered letters to its entire customer base. This release is being issued in an attempt to reach those consumers who did not respond to the direct mailing.